Although both countries are separated by the Spanish and Portuguese languages, there are deep connections between Cuba and Brazil. Historically these date back to the earliest beginnings of colonization and traffic in human beings. Well into the second half of the 19th century Cuba, Brazil beside North America were the main customers buying slaves from Africa. Many cultural roots of Cuban and Brazilian culture, in music, art and last but not least religion grew on this commercial route. The urban interventions of CUBABRASIL always communicate with the ordinary people on the streets. By doing workshops with children, disabled, students and artists and by our collaborations with community projects, we intensify this aspect. We bring colours into grey and dirty places. We paint the housing of the poor who can not even afford the plain paint. The Aerosol Art Movement of today is a global phenomenon. It is now almost 40 years ago since the spraycan was first discovered to be a powerful tool of expression. During all this time, uncounted talented and skilled artists evolved a unique and mysterious urban calligraphy. 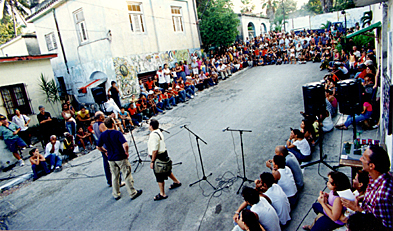 CUBABRASIL was the first event introducing this culture to Cuba. This project mixes classical techniques and styles with new forms of expression: Latex, oil paint and brushes meet spraycans. Contemporary Cuban and Brazilian Art meets Graffiti Art and Stylewriting. This topic is supplemented by �live painting� - video projections in the city. 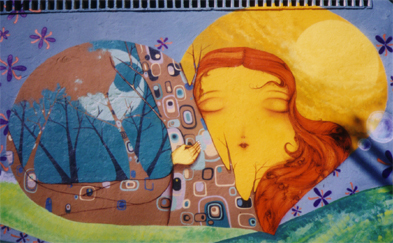 The collision of different techniques and styles becomes a colourful fusion on Cuban walls. In the Gallery all actions of CUBABRASIL are documented with pictures and information. - Marina Mike, for sending me to Cuba!! !